This is so much fun! I love Japanese! If your child feels this way, then we'll feel that we've achieved our goal. We all know that children have special abilities with languages. A child who is exposed to a language can effortlessly acquire native-like pronunciation, vocabulary, and grammar without even taking formal language lessons. Children can learn all these things while having fun, too. During these magic years, it's very important for children to have the maximum possible exposure to the target language, especially the language as spoken by native speakers. 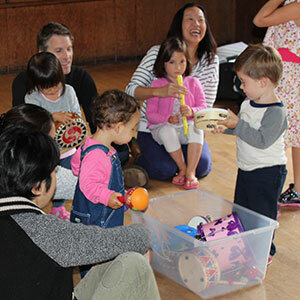 At Kotoba + Culture, we provide an opportunity for you and your children to gain exposure to authentic spoken Japanese while having fun with songs, dances, art, music, games, and picture books. 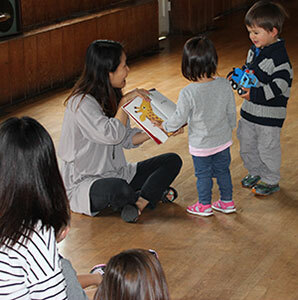 This way, you and your children will consider hearing and speaking Japanese to be a fun activity. In order for you and your children to gain familiarity with Japanese traditions, we will also do various Japanese cultural activities, including activities for "Hinamatsuri" (the doll festival), "Kodomonohi" (children's day), "Tanabata" (the star festival), "Otsukimi" (the moon festival), and "Oshogatsu" (New Years Day). In addition to learning about Japanese culture, these activities will help your children to increase their vocabulary. 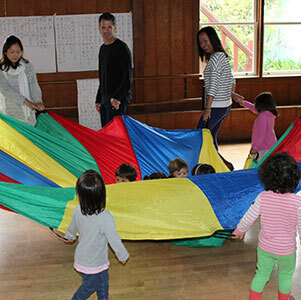 We believe that playing and learning in a fully Japanese environment is as effective and important as learning Japanese itself. Target Age Group: 1-4 years old. Requires one parent/caregiver per child. ​See this page for schedule, themes for each session, and tuition.